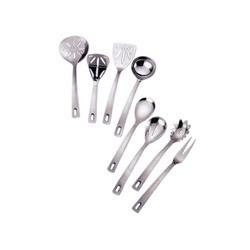 Manufacturer of a wide range of products which include measuring spoon, ss silicone handle tong, ss tong, salad server serving set, salad server set and serving tools. 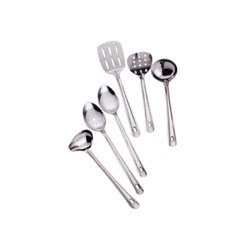 Backed with rich experience and knowledge in this sector, we are considered to be one of the most professional manufacturers and exporters of Measuring Spoon. Packaging Details: As par as customer requirements. Packed in Brawn Carton Box. EACH PIECE IN A POLYBAG AND MULTIPLE PIECES PACKED IN A CARTON. 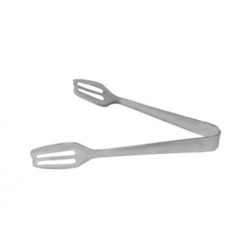 Owing to the expertise of our team of experienced professionals, we are able to manufacture and supply an exclusive range of SS Silicone Handle Tong. Owing to the expertise of our team of experienced professionals, we are able to manufacture and supply an exclusive range of SS Tong. Backed with rich experience and knowledge in this sector, we are considered to be one of the most professional manufacturers and exporters of Salad Server Serving Set. 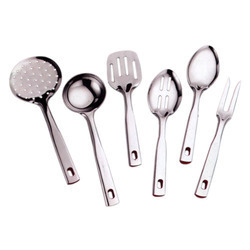 Backed with rich experience and knowledge in this sector, we are considered to be one of the most professional manufacturers and exporters of Salad Server Set. With the aid of modern machinery and technology, we have been able to manufacture, export & wholesale & supply Serving Tools. Our competent professional manufactures the entire range by using ultra-modern technology utilizing quality assured raw material and modern machinery. In addition, post manufacturing process is passed through a series of tests to make sure that we are offering an absolutely defect-free range. This range is made available as per client’s specification at the market leading price. 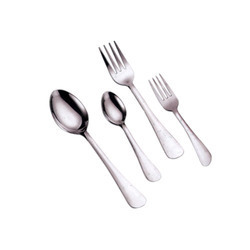 In line with clients' variegated requirements, we bring forth a distinguished collection of Spoon & Forks Cutlery. Our offered cutleries are designed in line with international quality standards using premium quality steel. These cutleries are available in unique designs and sizes as per the specified needs of clients. Tested on diverse parameters set by the industry, these cutleries are widely demanded all across the globe. Clients can avail the offered cutleries from us at market leading prices. 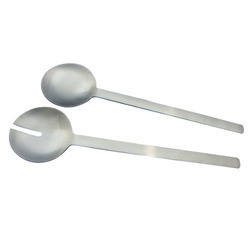 Backed by sound infrastructure, we are able to provide patrons with superior quality Spoons and Forks. 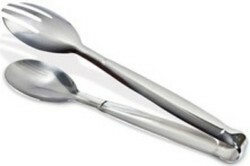 Our in-depth knowledge and industrial expertise enable us to offer a distinguished range of Stainless Steel Cake Tong. Our offered tools are intricately designed under the supervision of skilled professionals using quality tested steel and sophisticated technology in line with the international quality standards. Clients can avail these tools in diverse designs, shapes and sizes at market leading price within given period of time. 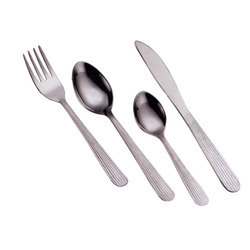 Backed with rich experience and knowledge in this sector, we are considered to be one of the most professional manufacturers and exporters of Stainless Steel Cutlery. 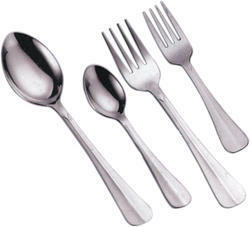 Backed by sound infrastructure, we are able to provide patrons with superior quality Stainless Steel Cutlery Set. 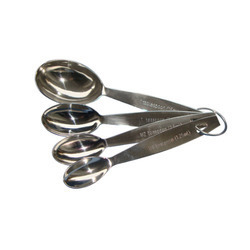 Our reputation in the market is largely attributable to our precision-designed Stainless Steel Measuring Spoon. Keeping in mind current market development, these baskets are manufactured by our qualified professionals employing premium quality steel and modernize tools. Apart from this, our experienced quality controllers perform a series of test on the entire range ensuring its flawlessness. Clients can avail the offered baskets from us at market leading prices. 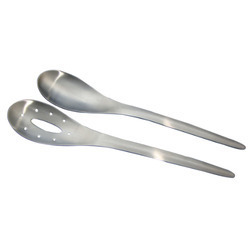 Backed with rich experience and knowledge in this sector, we are considered to be one of the most professional manufacturers and exporters of Stainless Steel Salad Server. 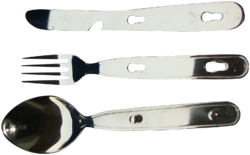 Holding vast industry experience, we have been able to manufacture, export & wholesale & supply Stainless Steel Serving Tools. 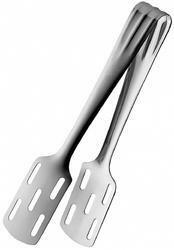 This serving tools is manufactured using quality assured steel and advanced technology. In tune with different requirements of our copious clients, we customize the entire range in diverse sizes and shapes. Our offered cutter has gained exceptional value amongst our clients for its defined features. 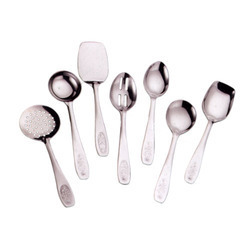 Moreover, clients can avail the offered cutter from us at market leading prices. 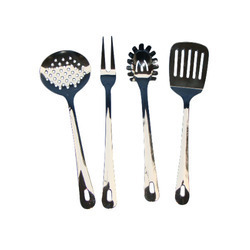 Backed with rich experience and knowledge in this sector, we are considered to be one of the most professional manufacturers and exporters of Steel Camping Cutlery Set. 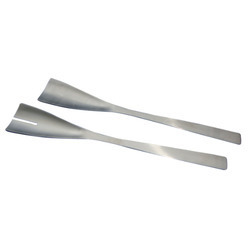 Size 7' 9" 12" 14" 16"
Owing to the expertise of our team of experienced professionals, we are able to manufacture and supply an exclusive range of Steel Tong. 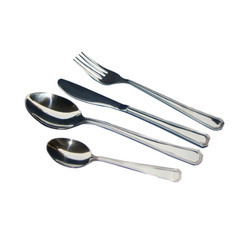 Backed by sound infrastructure, we are able to provide patrons with superior quality Tableware Spoons and Forks. Owing to the expertise of our team of experienced professionals, we are able to manufacture and supply an exclusive range of Tong. 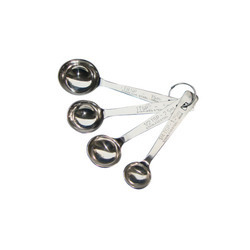 Backed by sound infrastructure, we are able to provide patrons with superior quality Tong. 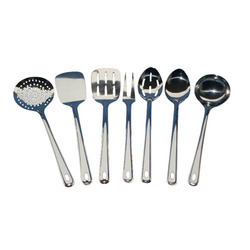 Backed with rich experience and knowledge in this sector, we are considered to be one of the most professional manufacturers and exporters of Kitchen Tool. 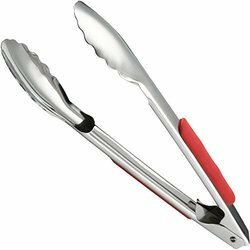 Backed with rich experience and knowledge in this sector, we are considered to be one of the most professional manufacturers and exporters of Kitchen Tool with Plastic Handle. 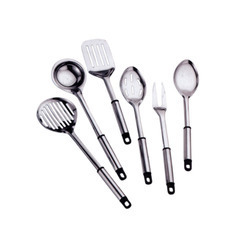 Backed with rich experience and knowledge in this sector, we are considered to be one of the most professional manufacturers and exporters of Stainless Steel Kitchen Tool.